hd00:13MOORPARK, CA - NOV 13: Civil War reenactors in "The Blue & The Gray" event on Nov 13, 2011 in Moorpark, CA. 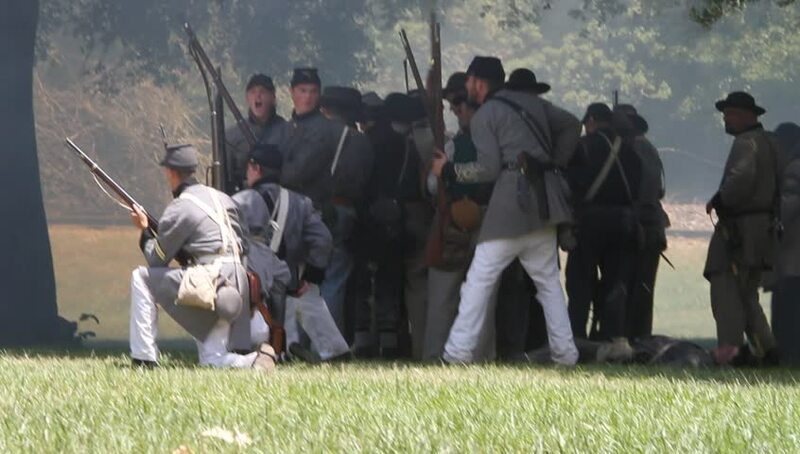 This event is the largest Civil War reenactment in the West. hd00:20FLORIDA - FEBRUARY 2015 - large-scale, epic Civil War 150th anniversary reenactment -- Union Soldiers, Re-enactors, reenactment marching, Drilling with muskets. in southern battlefield camp. 4k00:11AIGUES-MORTES, FRANCE - February 25, 2018: Parade of the manads of the Contest of Abrivado on the white horses of Camargue in France . In Provence, , Abrivado is traditional release of bulls. hd00:15VIRGINIA - MAY 2017 - large-scale, epic Civil War anniversary reenactment -- in the middle of battle. Confederate soldiers march into battle against Union Army, across tall grass field, fire muskets. hd00:18GETTYSBURG - JULY 2017 - large-scale, epic Civil War anniversary reenactment -- in the middle of battle. Union soldiers firing and fighting - loading & shooting muskets in smoke under enemy fire. hd00:09STAFFARDA, ITALY - CIRCA JUNE 2012: Historical reenactment of Battle of Staffarda fought during Nine Years' War in Piedmont-Savoy (northern Italy) between Louis XIV and Duke of Savoy army on August 18, 1690.